Collectible Toys For Sale Online! This is the beginning of our new Collectible Toys section, and we’ve got some interesting ones to start with. 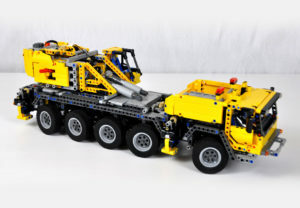 The Lego Mobile Crane MK II 42009 was the biggest, most complex LEGO® Technic model ever made when it came out, but it’s been discontinued so these are becoming highly collectible. 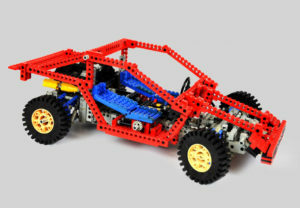 The Lego Technic Test Car 8865 set, released in 1988, was the third generation auto chassis and improved upon the technology in the previous version (set 8860), in many ways. Be sure to watch the demonstration videos (at the end of both Lego listings). These sets were quite a feat of engineering, and the many independent features they had are mind blowing! 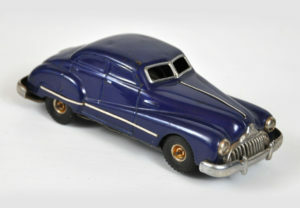 The Vintage Clockwork Gama Schuco Tin Windup Car, Blue Buick Sedan 100, was made in US Zone Germany, by Distler, during the early 1950’s. This was my Dad’s toy when he was a kid, and oddly enough, he bought an old Buick that looked just like it when I was growing up! Questions? If you have questions about any of our Collectible Toys, please ask on our Contact Page. Blue Buick Sedan 100 made by Distler in the early 1950s. Lego Mobile Crane MK II 42009 mostly assembled. Set 8865, released in 1988, was the third generation auto chassis.